This stuff works. I am an absolute dyed-in-the-wool Crème de la Mer fan, veering occasionally away in a flight of fancy, or due to a recommendation from a friend, or perhaps because a sample size of something-or-other is sent my way. ...Like Monu Recovery Balm, I used that one for some time and liked it, but after maybe two weeks of use, even with my trusty serum underneath, I found my skin lacking somewhat in the moisture department (as it was winter, I may revisit this one in the summer to see what I think. For this season at least, it's not for me). Sidebar: I have sensitive skin, combination in my t-zone, prone to rosacea in my cheeks, tending towards redness and dryness around my nose and occasionally the tips of my cheekbones. My skin is in between Type 3 and Type 4, and I have some pigmentation issues that I'm having IPL'd away as we speak (perhaps some more on that in another blog down the line when I'm finished it all). Because my skin is ridiculously sensitive, I am very wary of anything I use on my face, as a lot of products cause it to just plain hurt. CDLM doesn't, and for this reason (amongst others) I don't stray too far away from it. Anyhow, I can't remember if it was in a GlossyBox or a Carmine Box (I think they're one and the same now?) 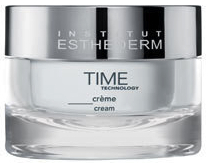 that I got the Time Technology Crème. At 10ml/9g/0.3 oz, a decent enough size to give it a whirl for about a month and see how I got on. So it got used, over my previous serum and now over my current serum for about a month and I have to say that this is a really really good moisturiser. It doesn't burn or sting (so it passes the sensitivity/skin-flare-up test). It doesn't have a strong smell (so it passes the headache test). It actually moisturises my skin (so it passes the skin-tending-towards-dry-patches test). It's creamy enough but not too creamy (so it passes the overloading-my-skin test). I started out using it mornings and evenings, but have found that I use it mainly in the mornings now (I've returned to CDLM in the evenings, but this is because I like to treat my skin somewhat in the evenings after a day of aircon, a very early start, and a lot of makeup in the last six weeks). It's made by a French crowd called Institut Esthederm and there are a few different ranges to their skincare products but this is the only one I've used. In terms of ingredients, it does contain shea butter, which is a wonderful moisturiser, but there's also silicones-a-plenty (and titanium dioxide, silica and mica - be aware that these ingredients can cause flash-back in photographs). In terms of product claims, it alleges that it brightens and revives dull/fatigued complexion, stimulating its ability to recover and eliminate toxins (hmmm, it doesn't do it any harm, but I haven't noticed my skin looking any more particularly brighter than with my CDLM, but at least certainly moisturised and well); also that the cream increases the skin's reflection of light (yep, that'd be the ingredients mentioned beforehand); and gives an immediate improvement in radiance (it contains mother-of-pearl, which helps with the radiance, but that's kind of cheating, but hey, if it works...), while also deeply nourishing over time for longer-term, sustained results (totally agree that it moisturises and nourishes, no two ways about it). Apply generously, especially over darker areas or hyperpigmention to illuminate and brighten skin (one of the product's claims is that it helps even out hyperpigmentation. Trust me, it doesn't. You need to use very specific products for this, and have bloody sore IPL or KPT laser treatments, and use SPF50+ every day to prevent it coming back).